GM Sergey Shipov is providing live commentary on the games at this year’s Sparkassen Chess-Meeting in Dortmund. In the first round Vladimir Kramnik played the rising star of Vietnamese chess, Le Quang Liem. 1. Nf3 At last! Congratulations all round on the start of the tournament! 1…Nf6 2. c4 c6 Clearly going for the Slav Defence. 3. Nc3 It’s impossible to stop the black pawn getting to d5. 3…d5 4. d4 dxc4 An opening that’s always in fashion. The Slav (or previously Czech) Defence has served many generations of grandmasters faithfully and well. And it’s not afraid of any computers, of anything prepared. Like a sturdy house with firm foundations has nothing to fear from the wind. 5. a4 A necessary precaution. Otherwise black plays …b5 and white will find it very hard to win back the pawn. 5…Bf5 6. e3 A solid variation. 6…e6 7. Bxc4 Bb4 Black combines development with a struggle for the central squares. 8. o-o o-o There are already subtleties here. 9. Nh4 In the absence of a black rook on h8 white can calmly exchange the bishop on g6. 9…Nbd7 Le prefers the exchange on f5, which leaves black the advantage of the half open e file, and retains control over e4. 10. h3 A flexible move. White, of course, will exchange the black bishop – but only when the most convenient moment presents itself. 11. Nxg6 …which is why Vladimir ends its stay on this earth. 11…hxg6 12. Qc2 White has gained the advantage of the two bishops, and a small edge in the centre. A small advantage for the next hundred moves – a very pleasant prospect for Kramnik. The current position has been known to theory for more than 40 years already. There’s nothing new yet… Judging by the deep thought of the Vietnamese chess player the theory that “he doesn’t dazzle in the openings” hasn’t been refuted. 12…Qe7 Black brings the heavy artillery towards the centre and looks for a chance to sharpen play with …c5 or …e5. 13. Rd1 This is just the arrangement of pieces to allow white to carry out the plan of seizing the centre with e3-e4. The move 13…e5 isn’t yet viable because of taking on g6. But 13…c5 is worth looking at – as a proactive measure. Though in practice black has always limited himself to preparatory manoeuvres. 13…a5 A logical move in its way. Black fixes his only achievement – control over the point b4. After 13…c5 14. a5! looks strong. However, after the move in the game white is free to advance in the centre. 14. e4 Of course. If there’s no pressure on d4 then there’s every possibility of developing the queenside conveniently. The bishop will go to e3, the a1 rook to c1. 14…e5 Understandable caution. 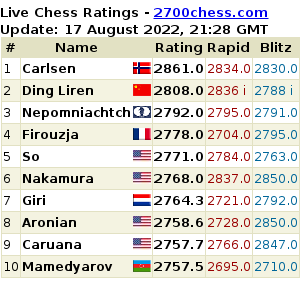 The white pawn might keep going. 16. Bg5 The black rook lined up against the white queen can be ignored for now. The most important thing is to retain piece control over d5. 16…Nb6 The tension around the unfortunate pawn on d5 is growing. It’s gone pale with fear. 17…cxd5 It’s high time for black to attack, while white hasn’t yet achieved an ideal set-up for his pieces. 18…Nc4 Le confirms the other theory put forward in the introduction. He finds his own, individual path, which isn’t the first thing that would come to mind. And, it seems, it’s not bad. The black knight is heading for the blockading square on d6. And if you exchange it, then white loses the advantage of the two bishops. For an impersonal participant in the conflict, for “white”, that’s not a great loss. But for a man, for a subtle positional chess player like Kramnik, it could really be quite annoying… By which I mean that the move in the game has a significant psychological component. 19. Bxc4 Vladimir decided on it! And rightly. With the knight on d6 black could play in perfect comfort. 19…Rxc4 While here the pawn on d5 still has the hypothetical possibility of pushing towards its goal. i.e. becoming a queen. 20. Qb3 Another unobvious decision. Did the queen have to be moved away from the centre? 20…Rfc8 In terms of time the players are almost synchronised: 0.50 – 0.48. And the position’s almost equal as well. 21. Nb5 Kramnik’s started to play quickly and decisively. He’s moved the knight out from under attack and prepared the d5-d6 advance. However, the white passed pawn’s unlikely to get past the d7 square. It would need to be given a little help – otherwise it’s impossible. By the way, the move in the game conceals another cunning threat. The rook on c4 is only safe while it’s supported by its friend on c8. And if white plays d5-d6 with tempo, and then moves the knight to a7 – the c8 rook won’t have any squares on the c file. On c5 it’s hit by the white bishop returning to e3. Le has sunk into serious thought – here it really is worth spending time. It’s the most critical of moments. 21…Qd7 A solid, reliable response. 22.d6 Tempting, of course. And essentially very logical – after all black’s using a general as a blockader. And not a knight, as we were taught. 23. Be3 Understandable caution. The weak point at f2 is worth covering. 23…Rb4 The rook’s no longer a victim, but an aggressor. 25…b6 An entirely explicable desire on black’s part to block the path by which white’s advanced forces could invade the back ranks. 26. Bxc5 bxc5 27. Qe3. Here’s the drawback of black’s 25th move – he’s now got a lot of weaknesses. However, for the moment there’s no reason to get upset. Winning back the pawn, white will allow the position to be simplified. For example, the greedy rook on b2 can be sent to chase after the pawn on a4. Or it’s possible to finally activate the queen, with 27…Qe6. 27…Rb4 Trust your first impressions! 28…Rxc5 29. Qxc5 Rxa4 The mutual gluttony is lowering the temperature of the struggle. Black’s position is holding. On the other hand, white had nothing better. 30. Qxe5 Material equality has been re-established. But the black passed pawn isn’t really any worse than the white one. 30…Rc4 There’s no time left to calculate long variations: 0.17 – 0.18. 31. Nc3 The d6 pawn doesn’t need the knight’s support. And so the knight heads for the centre. 31…a4 And there’s the counterweight on the scales for black. Their “weight” has taken its turn to strive to the queening square. And moreover, no-one’s blocking it, for now. 32. Nd5 Nxd5 33. Qxd5 Rc8 The rook returns to defend. If needed it can also support its passed pawn from behind. 34…Rc4 35. Qa6 One-move threats – the best tactic in time trouble. Times: 0.06 – 0.09 However, the addition of 30 seconds a move considerably reduces the effect of a lack of time. 35…Rb4 Le is precise and attentive. However, he hasn’t had a serious chance to blunder yet. 36. Kh2 A move for a move’s sake. Soon the white king can return to g1. Vladimir’s aim is clear – to get past the 40th move. 36…Kh7 Taking on board the example of their older colleagues, the young grow up. 40…g6 Time trouble has passed. The position’s equal. It’s time to drink coffee! 41. Rd4 A good move, a beautiful move. But it creates no threats. However, looking into it more I’ve noticed a cunning idea with an h3-h4 push. If the pawns are exchanged on h4 white sends the queen to h8, to the 8th rank. So after all, the positioning of the rook on f6 has its drawbacks… It’s clear that Le is striving for a perfect fortress – so that he can tread water and not think at all. But it won’t happen. He’ll have to deal with some concrete problems. 41…Re6 This move is a logical continuation of my thoughts. Black should activate the rook. Or at the very least, increase its options. 42. Qd3 Kg8 43. Rd5 Kh7 The exchange of the g5 and d6 pawns is unlikely to worry black. 44. Qg3 Kg8 Staying on the spot, keeping the pawn on f7. And it’s perfectly reasonable – the king will be healthier. 45. Rd1 Exactly… And now there are some unpleasant nuances for black. If he moves the king to h7 again then after taking there’ll be an unpleasant check from the white queen on h4, and the a4 pawn falls. Is it really zugzwang? So then, Kramnik has once more dazzled us with his subtle understanding. In what looked like a barren wasteland he’s found a small opening… It seems he’ll be able to get an ending with three pawns against two on one wing. Also drawn, of course, but with practical chances of success. 47. Qc5 Kh7 It has to be done! The white queen was threatening to invade at c7. 48. Rd4 An attempt to keep the struggle as complex as possible. 48…Rf6 Le’s no push-over! He’s sticking up for himself. And isn’t afraid of checks on the h file. Time to look at the clock-face: 0.23 – 0.25. However, it’s not long to the 61st move. And time will be added then. True, for the last time. 49. h4 I respect Vladimir Kramnik. Deeply and sincerely! All the ideas I write about in my comments, sooner or later, end up being used, under the refined control of the ex-world champion. Though it’s true that at this moment black has the right to exchange pawns on h4, as the white queen isn’t capable of swiftly finding its way to the back rank. 49…gxh4 And again the correct response. 51…Re6 52. Qc3 The attack along the long diagonal looks threatening. In addition, there’s the idea of planting a saboteur on h8 after Rd4-h4. 53. Qb4 g5 Another cultured, technical response. The black king is given enough space to hide from any attacks. Once more, and with complete conviction, I declare the position to be equal. 54. Rd1 However, Kramnik has every right to try and find the slightest of chances – as slowly as he likes. i.e. making a large number of seemingly aimless moves. But at the same time he has to act quickly. After all the clocks show only: 0.10 – 0.16 remaining. 56. Qd3 “We don’t need dinner!” Kramnik answered for both of them. While Le, no doubt, simply didn’t understand what I was talking about… Although I’m tired, I perfectly understand the vain hope Vladimir has. He intends to move the queen to d5 and noisily crush the rook on e6! After queen takes queen the pawn will be unstoppable on its way to d8 – and white will have an extra rook. There’s a child’s trap for you. 56…Re8 So is Kramnik now torturing himself thinking of how to set up that trap while not allowing the black pawn to get to a3? However, there’s not long to think any more. 57. Rb1 An attempt to get to b7. If the chance arises. 57…Ra8 Necessary… I also once wrote about the possibility of supporting the a4 pawn from behind with the rook. But I have the impression that was about a week ago. 58. Ra1 With his flag about to fall Vladimir chose the most solid move. 58…Rd8 Now that’s a real attack. 59…Qe6 At last! After 38 moves of hard servitude the queen has thrown off the yoke of being a blockader. 60…Rd7 So there’s the switch. The d6 pawn is once more totally fixed. And the second time control has passed. The players have received another 15 minutes. Plus 30 seconds per move. However, in such an unchanging dead-drawn position there’s no reason to think deeply. What will be, will be. 61…Kg6 62. Qb4 Kg7 Time until the end of the game: 0.09 – 0.17. 63…Rxd6 64. Rxd6 Qxd6 DRAW! So, the student successfully passed the exam. As much as the master tried to find a weakness in his preparation, he couldn’t do it. His first game in a major tournament, with black, and against none other than Kramnik! Le withstood that difficult test with honour. At no point during the game was his position bad. There’s no doubt at least one thing you can say about him – he’s a tough fighter… In the other games today, Ponomariov defeated Leko, while Naiditsch lost to Mamedyarov. So then, the first round was extremely hard fought. Working for you, dear friends, has been Grandmaster Sergey Shipov. Thanks for your attention, and see you tomorrow! Thanks very much for this service!! Very much appreciate your time and effort. Great site. Can’t even begin to tell you how much seeing such a fabulous annotator like GM Sergie Shipov (of ‘Crestbook’ fame) and reading his superb analysis & witty comments (pun city) properly translated properly into English is. Great effort! Thanks from Brazil! Thank you very much, mishanp, your site is a real joy! A million thanks, mishanp. Amazing service. Thank you very much! For non-russian speaking people (my native tongue is Spanish, but I am able to understand english quite well), these translations are great! Congratulations for Sergey , his comments are always welcome for chess fans.